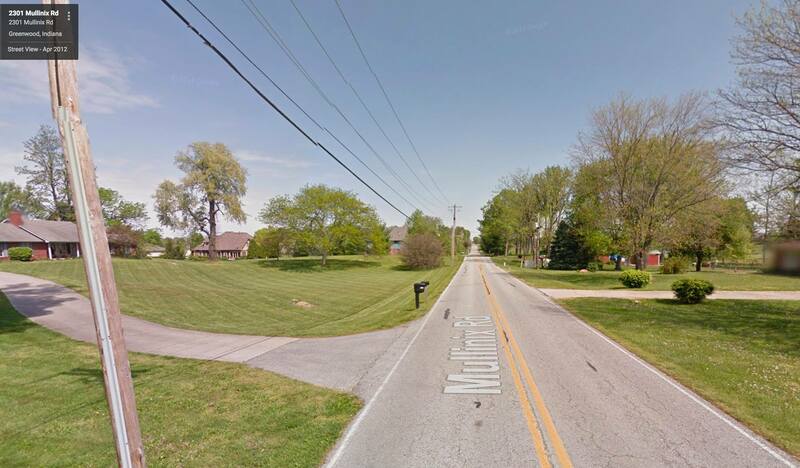 But in the meantime, we’ve run across yet another Mullinix place name with no indications of provenance, this one in the US, as follows: MULLINIX Rd., Greenwood, Johnson Co., IN, 46143 USA. According to Wikipedia: "The first inhabitants of the area currently known as Greenwood were the Delaware Indians (Lenape). In 1818, the Treaty of St. Mary's opened central Indiana to European American settlement, and by 1823 the first cabin in northern Johnson County was erected by settlers John B. and Isaac Smock on land currently occupied by Greenwood Park Mall. Greenwood was first known as "Smocktown" or "Smock's Settlement" in honor of the Smock brothers, and became "Greenfield" in 1825. Since this clashed with another Greenfield located in Hancock County, the name of the settlement was changed to Greenwood. Some claim the town's name was in honor of Samuel Greenwood, who platted the community in 1872." Anybody out there familiar with how this particular Mullinix Rd. got it’s name? We’d love to hear from you. From my research, the earliest document on the road itself is from April 22, 1921 article in the Angola Herald. See attached. Then in November 1926 there is an auction of a farm on this road. Owner was John Mullinix. Copy also attached. Last I heard back from the folks at the Johnson County Museum of History and here is their reply......heard back from Jeff Beck, a long time White River Township resident. Here is his reply! "A follow up on Mullinex Road comment. Spoke with Bill Paddack this week, he grew up on Mullinex Road. Bill stated road is named after grandchildren of Thomas Lowe who is buried at Lowe Cemetery on Mullinex Road, Deer Wood addition. Names of grandchildren are Petrey (sp) and Clarity per Bill." Thomas Lowe was married to Eleanor Robins. They had 4 sons and 2 daughters: one of the daughters, Charity married Permenter Mullinex, who were the parents of the children for whom the road was named. Not sure I have solved this Mullinix Road in Greenwood, IN but I did find 2 references in the newspapers. 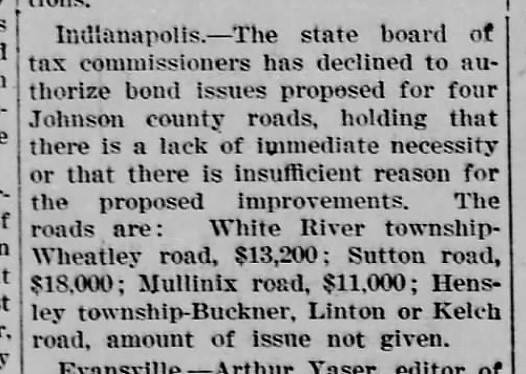 The 1st was in 1921 where the state was refusing to fund the road project estimated to be $11,000. 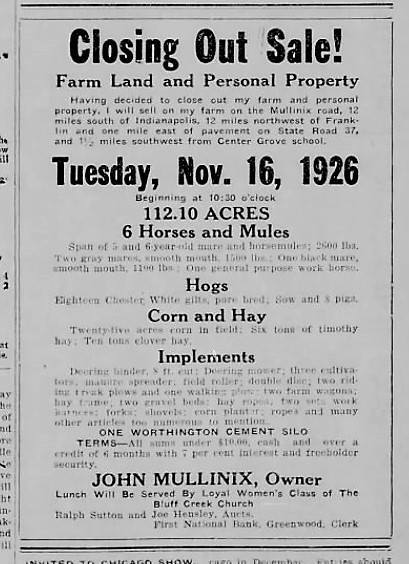 Then an ad placed in 1926 by John Maurice Mullinix (1877-1954) selling his farm located on Mullinix Road. Permenter Mullinix was in the area earlier than these articles but I cannot locate him residing on the street. I beleive it was for John Mullinix and his farm. Response 2 IMFA (US332 Wayne Straight) Thanks Karen, good work! So, it would appear that this road was named after scions of the Elkridge Mxes (although some would have it that they're Delaware Mxes.) The eponymous Susannah Greenberry, source of the many Greenberry Mxes, was married to Jonathan Mx, son of the original Jonathan Mx of Elkridge, MD. Permenter (aka Parmenter) was a son of one of those Greenberry Mxes. My husband Don Mullenix just send in his DNA sample and received the results that he is European Caucasian totally. He was born in Texas in 1938 and other relatives were born in Texas and Louisiana. We have found much data from the society and census. It is very interesting and we always want to learn more We now reside in Leesburg Florida. Very good to meet you, I'm going to get mine done as well. I've always been told where we are from but it would really be neat to know. We come from all walks of life and every place on earth….Our ancestors were awarded earldom for their service to king William II of Normandy. Also huge estates in England, Ireland and Scotland. The first Earl of Sefton is who my line descended from. The Irish side and I have seen some research someone else done that went all the way back to Norway and Denmark. And they followed king Rollo to Normandy. They settled in a riverside town of Molyneux set siene maritime of Normandy, where the family trade was running a mill by the river. When William the conqueror invaded England our ancestors supplied wheat and flour to his army at the battle of Hastings in 1066. We've got several knights Templars in our history as well. I think one of them even fought with king Richard Lionheart in the crusade. When king Edward VIII abdicated the throne to be with his true love, one of the earls of Sefton had a hand in that. He introduced the 2 and as a result caused a constitutional crisis amongst the monarchy. Imo, afterwards their would have been some tension and probably had more to do with the dissolution of the Earldom, that and having no male heirs. I could be wrong but just my opinion. I do know several vampire movies have been filmed in Sefton Hall and currently a miniseries about vampires is filmed there as well. My grandfather was Lafayette Edward Mullinex born in Springfield, IL. His line goes to France and Ireland…his mother after she was widowed moved to Missouri by ox cart. They eventually moved to Calif during 1930's. Where I was born. He worked as a teamster in Long Beach. And during the depression they moved to the country (Hemet) and started a turkey farm. His brothers, David, Paul,(can't remember all) moved to Arizona. Him and my grandfather Ed were both raised in Marion Indiana. My Dad Paul Mullenix, B 1926, was son of Harvey Ackley Mullenix, from Illinois. My line came from Ireland as well, the first of my line came here in 1703 from Kerry Ireland. That's where the shipped out from. But could have came here as early 1590 I believe. A Molyneux was also on the Mayflower Charter but don't know much about it. Just that they were linked to the Irish Klan's somehow. Pretty neat seeing all the names of other people, even though some spelling has changed, but all of the same family. Jeani West yes! We are 2nd or 3rd cousins Jeani!!! Thank you for the add. I am very excited to be part of this group. My great-grandmother's maiden name was Mary Mullennix. Her father's name was Moses Mullennix and his father was Gideon Mullennix who died during the Civil War. I am excited to trace back the family history. I really hope to come across some pictures during my search. My family is from the NE Indiana/NW Ohio region. Some dates and places would be helpful. A basic name and date of birth would be fine to get started. Do you have any Lancs Mxes? I don't think any of them were from Lancaster. I have them originating from New York. My 3rd great grandfather is Gideon Mullenix, born October 21 1811 in New York. He was the son of Moses (b: 1790) and Priscella Ayers (b: 1790). He lived in Defiance, Ohio and fought and died in the Civil War. He is buried in Lexington National Cemetery. International Molyneux Family Association - IMFA. Sue, based on that you are a member of the Branford (CT) Mx Line--the same one I'm descended from. Our earliesdt know Mx ancestor was Thomas Mulliner the Elder (ca 1550-1627), a master joiner in Ipswich, Suffolk, England. I guess I don't know what Lancs means then. :/ Sorry still very new to all this. The ancestors of the Molyneaux family who arrived in England around the time of the Norman Conquest of 1066 bore the name "de Molines". They came from Molineaux-sur-Seine, near Rouen, in Normandy where they were guardians of Château de Robert-le-Diable also known as Château de Moulineaux. They were granted lands in Lancashire. 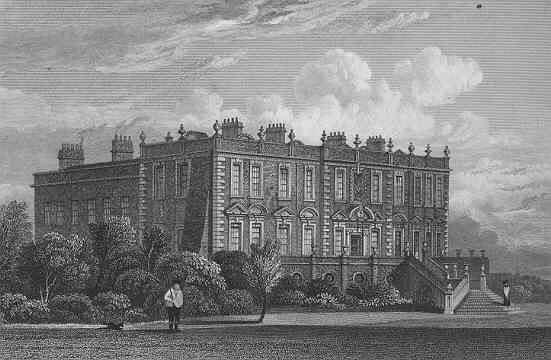 They can be shown to have held a large moated manor and St. Helen's Church at Sefton without interruption from about 1100 to 1700 before they moved to Croxteth Hall. Of the Molyneux family, Sir Richard (d.1290) and Sir William Molyneux (d.1320), knights of the Crusades, are entombed within the church, and are its oldest inhabitants. Their effigies now lie beneath an arch moulding set into the wall in the Molyneux chapel, which is outside of the 14th-century church walls The variations of the name include Molinex, Mullinix, Mullenneix, Mullineaux, Molinieux, Molinaux, Molineaux, Mollineaux, Molineux, and several others. Laterly, many variations were due to misspellings in American or other country's immigration services. Although Anglo-Norman surnames like Molyneaux are characterized by many spelling variations, the name Molyneux has prevailed with the modern trend towards standardisation. Sir Richard Molyneux, 1st Baronet (1560–1622) was a Member of Parliament for Lancashire, Mayor of Liverpool and Receiver-General of the Duchy of Lancaster. Molyneux was the son of William Molyneux and his wife Bridget Caryll. His grandfather, Sir Richard Molyneux (1528–1568) was MP for Liverpoole from 1562 to 1571. He was educated at University College, Oxford. In 1581, Molyneux was appointed by substitution MP of Wigan, replacing Sir Edward Fitton and knighted in 1586. In 1588–1589 he was Mayor of Liverpool and in 1588 and 1596 High Sheriff of Lancashire. He was knight of the shire (MP) for Lancashire in 1584, 1593 and 1604. He held the office of Receiver-General of the Duchy of Lancaster from 1607. He was created Baronet Molyneux in 1611. On his death he was buried in Sefton parish church. His seats were Sefton Hall, Sefton and Lytham Hall, Fylde. He left his estates to his son Richard. Hello cousins. I've just recently started working on my Mullenix line, and have not yet been able to find much available verification. My earliest known Mullenix ancestor is my 4GG, William F Mullenix b. abt 1801 SC. Married Catherine V ? before 1830. They were living in Lawrence Co, AL from 1830 - abt 1850. They were living in Itawamba Co, MS in 1860. I haven't found a connection to TN for him, but I have a dna match at 70cM/4seg, with someone who has an ancestor, Celia Ann Mullenix b.abt 1825 TN, supposed dtr of James Pleasant and Sarah ? Mullenix, living in DeKalb Co, TN. I also have a dna match at 27.5/2 cM's with someone who's also a descendant of James Pleasant in TN. I'm interested in comparing information and dna results with anyone who might know something about this line. Also, have members of this list completed the dna testing? Have people uploaded to Gedmatch.com, in order to compare matching chromosomes? My maiden name is Mulanix, there were quite a few in Mo. Not sure if this helps you out! Hi Elaine, I know that some of my distant TN Mullinax family migrated to MO. Do you have a gedmatch # I can check? Also, the names of any TN Mullenax ancestors, or perhaps your oldest MO Mullenax ancestor if you don't know the TN ancestor? Thanks, my gedmatch # is A222501. Susan, do you have a gedmatch number that I might be able to check to see if our Mullinax's might be connected? Also, do you have Mullinax ancestors from TN? Thanks, my gedmatch # is A222501. Debbie we have a legitimate match on Chromosome 7 my gedmatch is A109376. Andrew Mullenix A MULLENIX FAMILY From Book: Written in 1958 by Blanche Hamlett Baldridge "A Mullenix Family of Virginia, Kentucky, Ohio, Indiana, and Iowa"
The Principal part of this record has been compiled from family records, with some information obtained through research of various county records. Have given first the Mullenix family followed by the maternal lines, the Lynchard and Talbot families. For information of the origin of the name, the early English and Irish families and the Coat of Arms, refer to "History of the Molyneux Families" by Nellie Zada Rice Molyneux. The name Mullenix (Molyneux) originated in France. Members of the family settled in England and eventually some of them went to Ireland. Our Mullenix ancestors came to America by way of Ireland prior to 1740. In that year John Mullinax, wife Mary lived in Goochland Co. Va. where they were referred to as Scotch-Irish. An inventory is recorded in this county for John in 1754. Note: There was a Mullinax on the Mayflower. John Mullinax (7th Great Grandfather) came to America by way of Ireland prior to 1740. In that year John Mullinax, wife Mary lived in Goochland Co. Va. where they were referred to as Scotch-Irish. An inventory is recorded in this county for John in 1754. Had 3 children; William, John & Mary. William Mullinax (6th Great Grandfather) b. in Ireland d. 1780 ( yo) Goochland County Va. m. Rachel Powell in 1755, had 5 children; Archibald, Mary, Rachel, Samuel, & John. Archibald Mullinax (5th Great Grandfather) b. Nov 10. 1756 Goochland Co. Va.
m. Mary Powell, b. Feb 5th 1786. Archibald Mullinax served in the Revolutionary War as a soldier of the Infantry. Received a bounty land warrant. As late as 1794 He was on the Muster roll list of Pendleton County Va. under Capt. Wm. James Company, Militia. Several spelling of the Mullinax name were found on various documents, war records, Mollineux, Mullineaux, Mulleneux and Mulinx. Archibald was proven up in the National Society of the Daughters of the American Revolution under national Number 403073. Children; Archibald, Nancy, Rachel, John, Thomas, William, Benjamin, & Jesse. Thomas Mullenix (4th Great Grandfather) b. July 18, 1800 in Pendleton Co, Va. d. 1871-72 (72 yo) in his home near Prescott Adams Co.
m Mary Lynchard, b. d.
Children; William, Rachel, Mary, Prudence, Thomas, David, James, Archibald, & Elizabeth. David Mullenix (3rd Great Grandfather) b. March 2, 1843 near Greensburg, Decatur Co. Ind. d. Dec 23, 1918 (75 yo) in Otumwa Ia. G.A.R. addition: Served in the Civil War, Company C Ninth Iowa Cavalry ;Enlisted Aug 21 1863 Wapello Co. Iowa. Mustered in Nov 30 1863 mustered out Feb 28 1866 in little Rock Arkansas m. April 11, 1867 to Rhoda Jane Kight in Ottumwa Iowa. David & Rhoda moved around lot they lived in Iowa, Nebraska, Washington, Missouri & California. Members of the United Brethren Church, David taught Bible School most of his Adult life. Children; John Wesley, Mary Jane, Martha Ellen, Sarah Lauretta, & Richard. 59-1 Jesse Birdis Mullenix b: June 29, 1892, Ottumwa, Wapello County,IA, d: Dec 11, 1949, (57yo) St Paul, MN Served in the U.S. Marine Corps, World War I. Saw action in France. m. ? in 1915 at St Paul, Minn, no Issue. Was a Pilot flew a plane all the time. 59-2 Lester Olean Mullenix (Great Grandfather) (SSN:496-12-6325) (Gramps) (Ancestry World Tree Project: FROM THE ANCESTRAL FILE OF CHARLES WARREN LANZ ) b.Oct 26, 1896 Dahlonega, Wapello Co. Iowa. d March 3rd 1974 (78 yo) Served in the US Marines, World War I, from August 14, 1915- June 25, 1919 saw action in France, Served with the 66th Co. 5th Regt. US Marine Corps also served in 122nd Co., 9 Regt Guantánamo Bay, Cuba m.Martha Leeper Mitchell (Great Grandmother) (SSN:486-38-5923) b. August 22, 1901 Coatsville, Mo. d. August 4, 1995 (94yo) Children:Tim, Berniece, John Alfred, Elizabeth, Owen, Wanda. Issue: 60-1, 1-2 David Cordon Mullenix b. March 10, 1974 m.(9-11-2004) Danielle Gray b.April 15, 1974? 60-1, 2-2 Andrew Owen Mullenix b. April 25, 1984 in Bridgeport, Ct Like · Reply · March 12 at 1:25pmAndrew Mullenix I have this, maybe you can find some connection in there. Thank you Elaine, Susan and Andrew. I know that a number of my Mullenix line went to Missouri. I think my line included a James Pleasant Mullenix b. abt 1776 SC. Supposedly his parents were Richard Mullenix b.abt 1745 Sussex, Delaware and Eliz Poynter b. Delaware. I haven't yet verified this parentage - if, indeed, it can be verified. Have the Mullenix descendants in this group taken the Ancestry dna test and uploaded to gedmatch? I find the dna matches to be the best genealogy tool. Lisa, as my Mullinax's also appear to have lived in TN, may I please have your gedmatch number to see if we have a match? Mine is A222501. Also, do you know the names of your TN Mullinax ancestors? I do not have any of that information. My father was Johnny Edward and his father Franklin. The question I'm interested in asking on this group is - have my Mullinax cousins taken the Ancestry dna test, and are you on Gedmatch.com? I would be interested to compare our numbers on there. Mine is A222501. Thanks. My paternal grandmother is Mildred Mullinax Chandler Buttram Berry. I am on ancestry . com. Angela Sendelbach. I have done the DNA. i also uploaded my results to gedcom. Thanks, Angela. I think I just followed your Mildred back to a John Mullinax, 1705 England. This was just using others' trees, no verification. I think mine goes through a Richard Mullinax, b.1745 Delaware and William Mx b.1696 Maryland. However, I haven't confirmed these. May I please have your gedmatch number in order to check to see if we might have a connection? Mine is A222501. Thanks. Angela I do not match you. Debby; You may belong to the Pleasant Mx Line--one of the I2b Alliance that includes a number of Mx clans from the S.E. US as well as several in England. Check out the IMFA Web pages to get more info. Thanks, Angela. It looks like our Mullinax families don't match - back to the late 1600's anyway. I found it confusing. That GED. It's really a great tool for finding ancestral connections. I try to keep up with my closest matches, figuring out on which line we match.